A man who opened fire on vehicles on the Hood Canal Bridge was wanted for questioning in the slaying of a woman in a Renton motel. 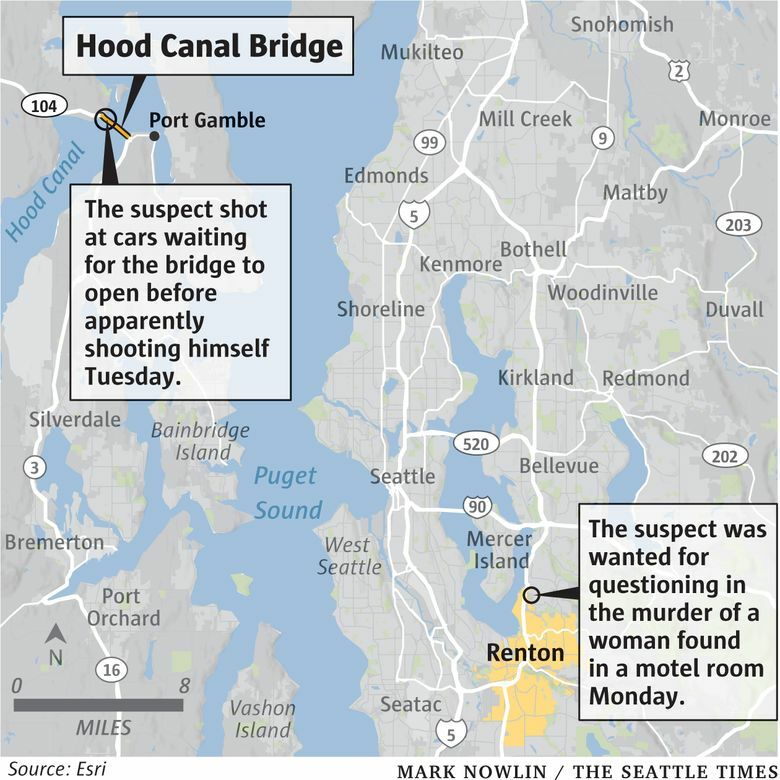 Police say a man who opened fire on vehicles on the Hood Canal Bridge early Tuesday before killing himself was wanted for questioning in the slaying of a 38-year-old woman in a Renton motel. The man was identified by Renton police and the Washington State Patrol as Krishna Mahadevan-Prasad, 20, from New Jersey. The Renton Police Department identified Mahdevan-Prasad as a suspect in the July 23 slaying of a Bellevue woman, 38, whose body was found Monday afternoon in a hotel room at the Econo-Lodge, 4710 Lake Washington Blvd., according to a news release. The woman suffered numerous cuts to her body including what police said appeared to be intentional mutilation after she was dead. Renton detectives said the “circumstances” of the homicide have investigators concerned that Mahadevan-Prasad may be responsible for other acts of violence. Mahadevan-Prasad was active-duty military and his travels are unknown. Police did not specify which branch of the military. Authorities said Mahdevan-Prasad was armed with a rifle and a shotgun when he opened fire about 3:42 a.m. on parked vehicles waiting for the Hood Canal Bridge to open after being closed for maintenance. He fired through a car in front of him, missing the driver and two children, ages 5 and 6, who were asleep in the vehicle. A bullet passed through the driver’s head rest. The driver of a van parked behind Mahdevan-Prasad’s 1995 Honda Accord suffered a glancing bullet wound to his elbow and was in stable condition, according to Trooper Chelsea Hodgson. After firing on those vehicles, Mahdevan-Prasad apparently shot himself, Hodgson said. The shooting occurred in the eastbound lane at the west end of the bridge.